Since Petit Four opened on April 15th, 1998. 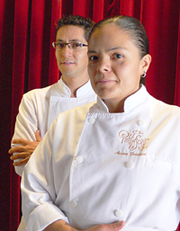 Norma Guerrero and Paco Cárdenas have shared their passion and joy for pastries with locals and visitors from many places throughout México and abroad. As you walk down the street of Mesones you can smell the aroma of what they are baking for you, whether cookies, breads, pastries, or even an elaborated wedding cake. Be sure to stop by and try one of their delicious pastries and enjoy it with a cup of coffe or a hot chocolate. Everything at Petit Four is handcrafted from the finest and most fresh ingredients but love and dedication are the most important of all. Everything is baked in small quantities several times a day to ensure freshness and flavor. 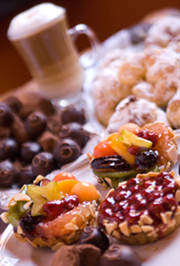 At Petit Four they also cater to special events, weddings or just large orders. Just place your request in advance and they will prepare it for you. If you can imagine it, they can bake it. Visit the info section for more details.